Things have finally calmed down around here. We're done moving and the little giggler is feeling great. I found some time to finish this romper tutorial I've been working on. 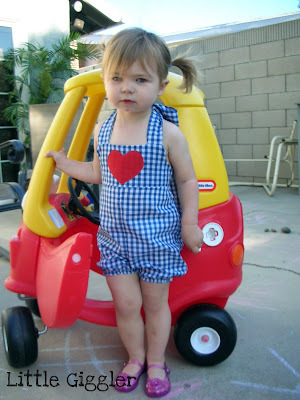 It's the same kind of romper I made for thelittler giggler's birthday. First print and cut your pattern pieces. When you print make sure it's a full page photo print. I made this for my daughter. She just turned two. 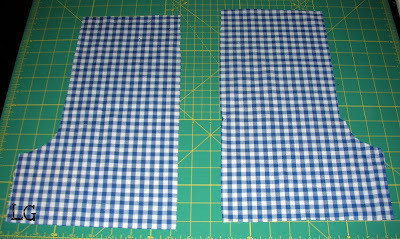 Also cut two 32" x 4" pieces for the straps. 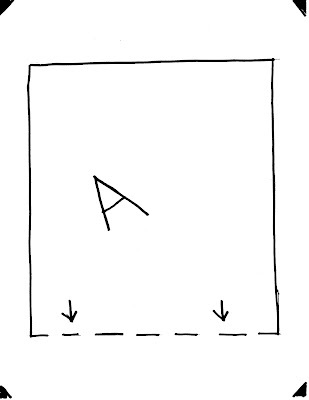 Attach A & B at the dotted line. 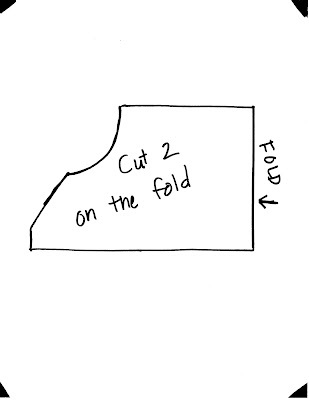 Allow for seam allowance when you cut. You should have four of theses. And these. For some reason it didn't occur to me (DUH) that I could fold my straps in half so I cut four 32" x 2" pieces. Lets start with the straps. 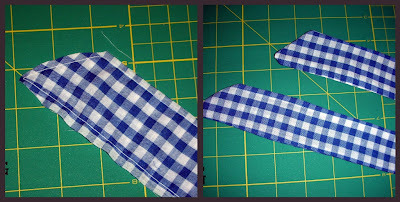 Fold them in half lengthwise right sides facing each other and sew the raw edges together. 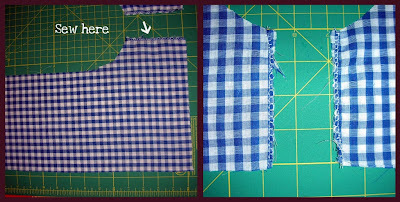 Leave one end open and sew the other end shut in an angle. 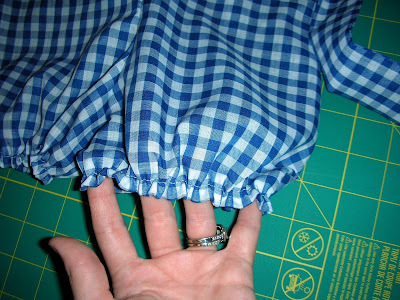 Carefully turn them inside out and iron them. Now grab your two top pieces. Lay one piece down right side up. 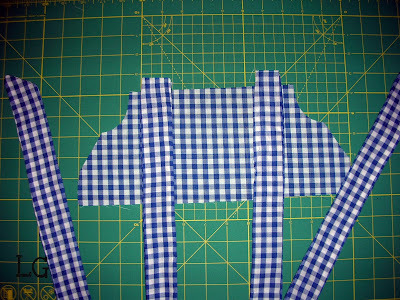 Place your straps one top as shown in the picture below. You can let the ends hang straight down so they're not in the way. 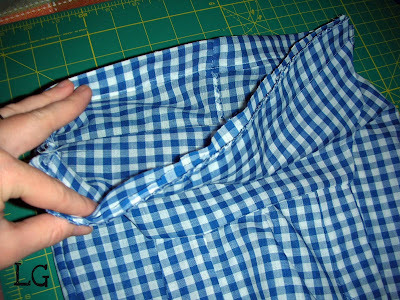 Place your other "top" piece directly on top with the right side facing down. Carefully pin together so the straps stay put. 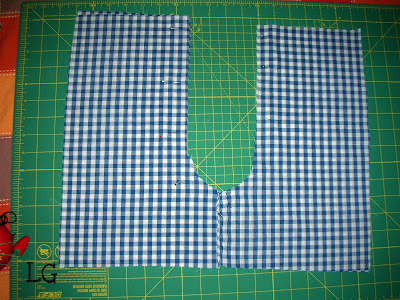 Sew together leaving the bottom open for turning. Be careful not to let the straps get in the way when your sewing around the arm pit. Next turn it right sides out and iron flat. Set your top aside for now and grab your four bottom pieces. 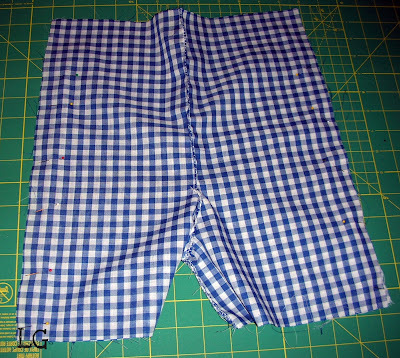 Take two of the four and lay them together with right sides facing and sew when indicated in the picture. Do the same for the other two pieces. Open up your bottom pieces and you should have two horseshoes. 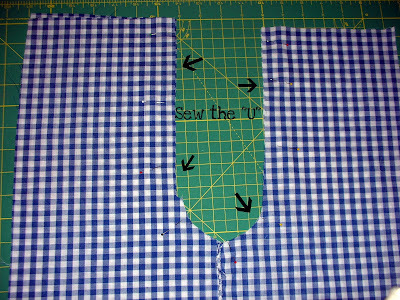 Place them together with right sides facing each other and sew the "U's" together. Now if you flip them around they look like a big pair of shorts. 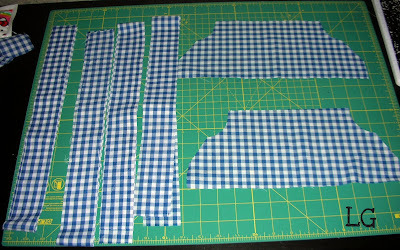 Keep the right sides facing each other and sew the sides shut leaving two inches at the top on each side so we can put the pieces together and add elastic. 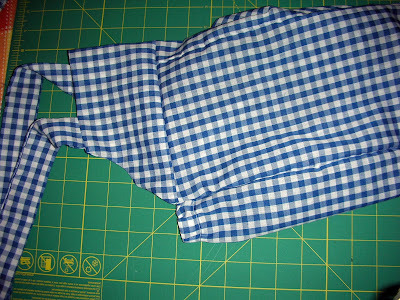 Lets add an elastic casing at the top of our romper, but only on one side. Cut your elastic to half the size of the romper. It doesn't have to be exact. 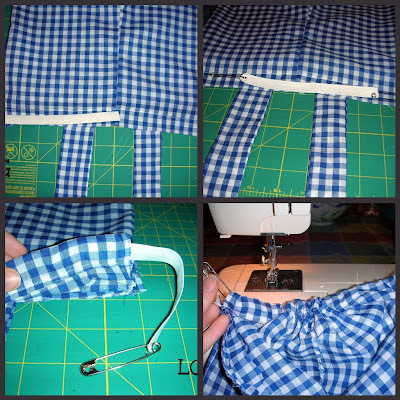 Add safety pins on both ends of your elastic strip. This just makes it easier to control. Feed the first safety pin through the casing until the other end of your elastic matches the end of your casing. Sew into place. Next finish feeding the elastic through the other side and sew at the other end of the casing. 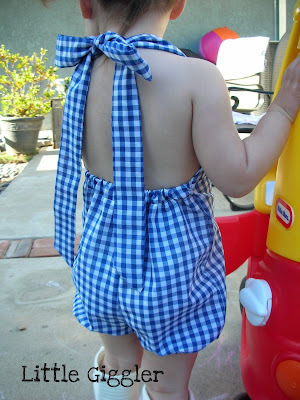 Now turn your romper right side out with the front facing up (not the elastic side). 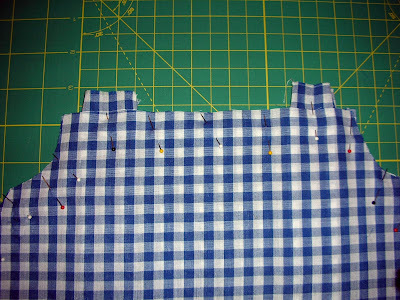 Pin your "top" piece to the front with the raw edges matching up. Sorry for the crappy picture. I hope you get the idea. Note: There's no elastic in the top picture. I decided it works better when you add it first. Now you have your "top" on and your elastic in. 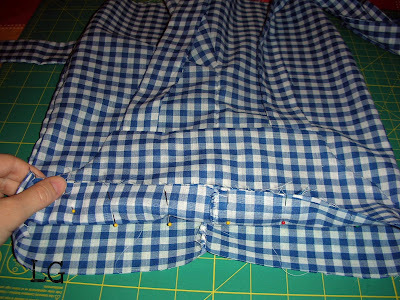 Turn inside out and finish sewing the sides shut. 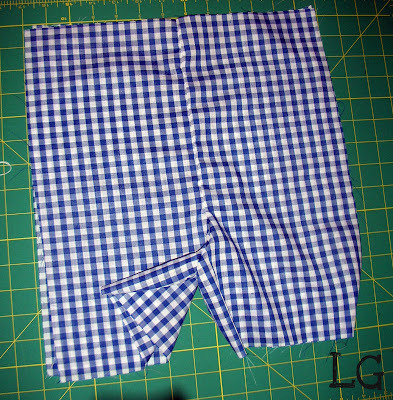 Last, we're gonna hem the legs with elastic thread. Hand wind the elastic thread around your bobbin. Don't pull in too tight. 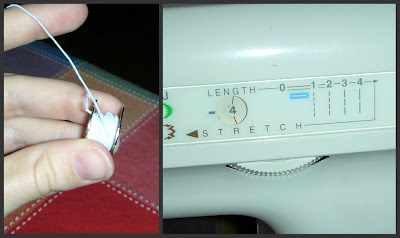 Set your sewing machine to it's longest straight stitch. Mine is four. Now hem the legs making sure the elastic is on the wrong side. 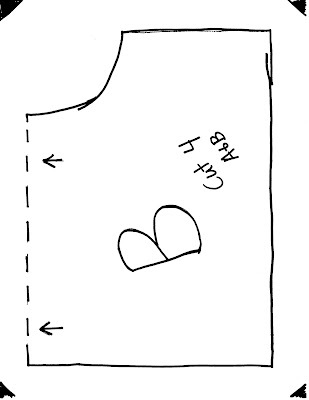 Make sure you backstitch and the start and finish so it doesn't unravel. 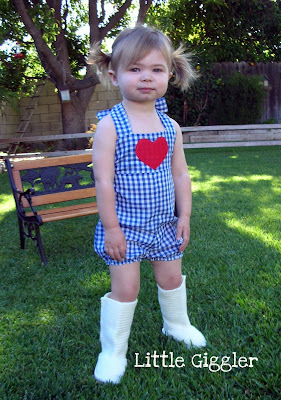 I decided to add a heart applique to up the cuteness factor.